The blood that runs through our veins and arteries acts very much like the main roadway system with many routes going to small villages or major city’s. Passing along this main road system are the vans and wagons that would be delivering to various shops, etc. Our vans and wagons are in the form of oxygen, nutrients and heat along with chemical messengers and hormones carrying away wastes products for excretion by the kidneys. The heart has four chambers, the atrium, and ventricle on the left side of the heart pumping oxygenated blood to our bodies. The two chambers on the right-hand side pump de-oxygenated blood to our lungs. To stop any backflow of blood valves at the exit of the chambers act like one-way valves, and stop any blood returning after it has passed through. Very much like the one-way valve in a Combi-Heating system works when it needs topping up (It will allow the flow of water one-way only forward). Many things can affect the hearts pumping action. Heart failure would cause a weakening of the hearts pumping action impairing the circulation, or arrhythmia which is an irregular heart rate. There are other problems such as atherosclerosis which would involve a narrowing of the blood vessels and may be clogging by fatty deposits. When this happens the blood supply to the brain is reduced. 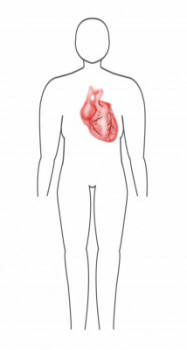 Also affected could be the extremities or the heart muscle causing angina. It is possible for these last problems to cause clotting in a blood vessel. If a clot happens in an artery to the brain it will result in a stroke, if it is a clot in the arteries to the heart muscle it is known as a coronary thrombosis. Hypertension is a most common cause of circulation problems. This complaint is caused by the pressure of the blood pressing against the vessel walls as the blood circulates around our bodies. Although it is not fully understood why this happens a doctor would try to find an underlying condition that could be the cause. There are several conditions that may trigger hypertension such as Raynaud’s disease (causes your hands and feet to change colour and become painful when exposed to cold or stressful conditions), and a migraine both complaints are caused by temporary alteration to the size of blood vessels, or maybe arteriosclerosis this is where the blood vessel walls lose their elasticity. If you suffer from heart disease you may be prescribed one or more types of heart medication. One such medicine given for Angina could be Amlodipine. This is because heart disease often comes with more than one concern. Depending on what your doctor prescribes for you there are different medicines for differing problems. Some of them work directly on the heart to alter the rate and rhythm of the heartbeat. These are known as antiarrhythmics and include beta blockers and digoxin. There are other drugs such as vasodilators to improve blood flow which results in lower blood pressure, or vasoconstrictors which do as the name suggests and constricts blood flow. Drugs such as diuretics which are used in the treatment of hypertension and heart failure increase the body’s need to pass water, or pee. Blood cholesterol levels can be reduced by the administering of lipid-Lowering medication which reduces the risk of atherosclerosis. There are also drugs that can be prescribed to reduce the risk of blood clotting, these may be given if the patient is at risk of abnormal blood clots forming in the heart, arteries or veins. These particular drugs would be given if the bodies natural clotting ability is defective. Hopefully this overview will help all of us to understand how much this marvelous pump can be taken for granted. Since putting this part of the website together I have become more aware of what our bodies need to do to keep us healthy especially the heart muscle, and the workload our hearts deal with day in and day out. Yes, I know it’s easier said than done giving up smoking I mean. Yes, I do know how giving up can be extremely hard and challenging, requiring lots of willpower. Yes, your right, I did smoke for many years, and yet again you’re right I have now give it up. It took 3 years of hard slog, often putting me through many days of ups and downs, but I got there in the end and I have never looked back. Gone are those bad chest pains, gone is a cough that felt like you were coughing your heart up, colds and other virus have found somewhere else to live. I can say hand on heart packing in the cigarettes was the best Christmas and Birthday present I ever gave myself, and not to forget my partner because without her help and guidance, I may not have been able to add this little footnote.